During tryouts for a high school basketball team, the coach tactfully pulled a young student aside and said, “Perhaps you should try tennis.” The young man hung his head in despair, but picked up a tennis racket and turned the rejection into a winning high school and college tennis career. Greg Smith went on to study under Vic Braden, managed tennis clubs for more than 30 years, and now works privately with students in the United States and Canada. Why do our mentors and friends suggest “try tennis” when we face a challenge, a bad day at work, or rejection from the basketball team? Because it works! Blasting a yellow ball back and forth is good for mind and body, affordable, builds friendships, and can be therapy for a day’s frustrations. The benefits don’t end there. On June 6, 1944, D-Day, Art Larsen, a young American soldier in the 15th Cavalry, 17th Squadron, landed at Omaha Beach in Normandy. Larsen, a tommy-gunner, survived, but his most of his unit did not. A few months later, Larsen was engaged in a battle in Brittany, France. The Americans used air support and firepower to force the Germans out of the city of Brest, a key port held by the Germans and needed to provision Allied troops. To defend their position, the Germans had stockpiled ammunition and entrenched troops throughout the city. Larsen’s unit had to advance house-to-house in intense fighting. After several months, the Germans surrendered the city, but had rendered the port facilities useless. The City of Brest was razed to the ground. Larsen was awarded four bronze campaign stars. He had witnessed firsthand the horrors of war over his three years of heavy combat reconnaissance missions. Mental scars ran deep. 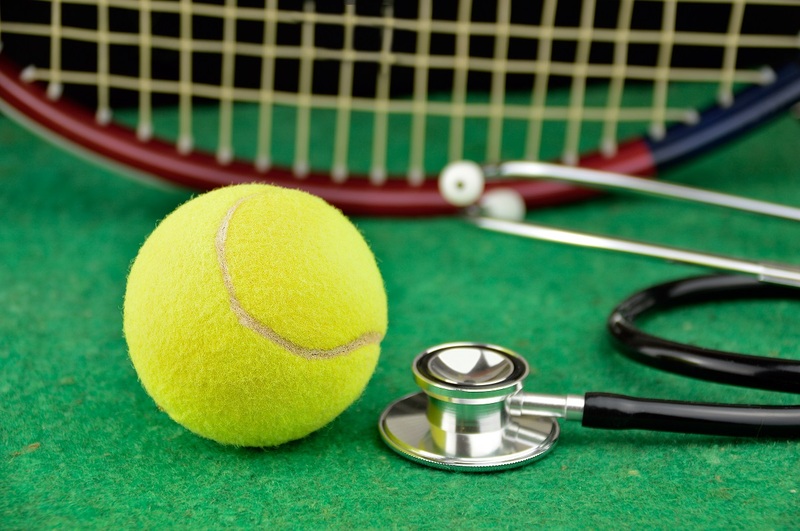 His doctor prescribed tennis. “I was so nervous and shell-shocked that the exercise in the open air, through tennis, was the only thing that cured me,” said Larsen. Five years later, Art “Tappy” Larsen (1925-2012) won the 1950 U.S. National Championship, the precursor to the U.S. Open, and reached the final of the French Championships (later the French Open) in 1954. He was ranked in the world’s top-10 several times. Larsen earned the nickname “Tappy” because he tapped objects for good luck. When he went through a doorway, he would tap it with his toe—one tap for Monday, two for Tuesday, etc. On the court, he would tap the net, the umpire’s chair, the baseline and opponents. He smiled at birds that flew over the court believing they brought good luck. His eccentricities were tolerated by those who knew of his military service. The tennis court will always be a strong competitive environment for the exceptional athlete. Tennis is also the game that welcomes casual players to stay in shape and enjoy friendships. And it is a refuge for players looking to sort through a day’s challenge, a life’s struggle, or maybe even rejection from the basketball team. Barbara Wyatt is a Writer, Photographer, USTA Official, and Mobile App Developer of iKnowTennis!, the tennis rules app. Her poem, Ode to Tennis, an amusing poem on the joys and frustrations when learning tennis, is available at Amazon. She can be reached by e-mail at BarbaraW@iKnowTennis.com.